Shirts are often underrated. Lying beneath tailored jacket and silken tie, they can seem less important than both. But in an age when men usually take off their jacket during the day, indeed often don’t even wear a jacket to the office, the shirt has assumed new importance. So read. A bespoke shirt is not easy to fit well. There’s the amount of give at chest, waist and hips, the width through the arm and balance. But it’s not as complex as a bespoke jacket. In fact, three aspects of fit are by far the most important: neck, wrist and waist. Shirts come in neck sizes and often sleeve lengths as well, so as long as you know how these should fit (two fingers just about fit under the collar, sleeve stops at the base of your thumb) you’re most of the way there. Then, unless you can find a cut that’s exactly right, take the shirt to your tailor and get darts put in. Most do it and they can get the fit just right. Put some extra detergent on the armpits, collar and double cuffs of a white shirt before you wash it. At least do the armpits on every other colour. Sweat stains are a poor excuse to rid of a shirt. There’s nothing wrong with wearing a shirt without a tie. Just make sure the lack of a tie’s silk is made up with colour or pattern elsewhere. And that your collar doesn’t collapse. Many things determine the ‘stand’ of a collar, which prevents it from folding up meekly below the lapel of your jacket and negating the point of wearing one. These things include the collar’s height, construction and spread. You know which of your shirts have it; only wear those ones without a tie. And if in doubt, get a button-down. White is clean, crisp and smart; it should always be the default at a formal event, indeed traditionally would always have been changed into for the evening. Blue is more versatile and flatters more skin types. It can handle dark, pale and bright colours where some can make a white shirt look cheap. You will probably end up with more blue than anything else. Nothing wrong with that: experiment instead with cloth, weight and weave. The first thing that will go with shirts (if you’re washing them properly) is fraying at the corners of the collar and the edges of the cuffs. 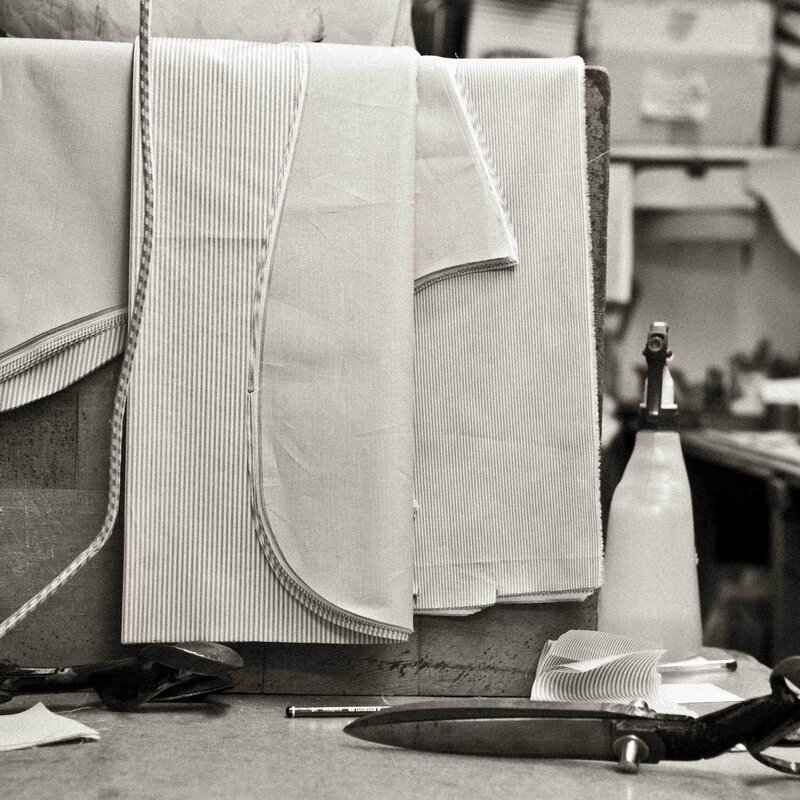 If it is bespoke, the maker might be able to replace them, probably with white equivalents, at less than half the cost of a new shirt. But you don’t have to; fraying isn’t necessarily bad. Like distressed jeans, it’s something some designers even add to shirts to make them seem more personal. As long as the shirt isn’t a formal, double-cuffed and spread-collared affair, then continue to wear it but with jeans and tweed at the weekend. 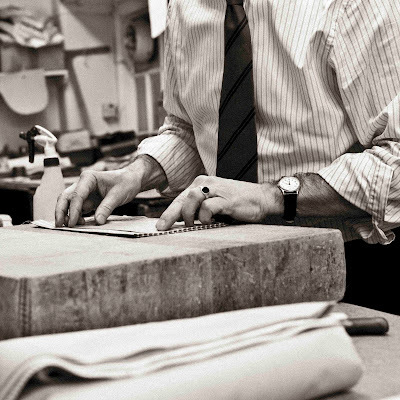 Pictured here: Budd bespoke shirts being made. The refurb of Budd is coming along nicely and sounds like it will be a more welcoming place to buy and have shirts fitted. Looking forward to seeing the finished product. You can follow the discussion on Five tips on shirts by entering your email address in the box below. You will then receive an email every time a new comment is added. These will also contain a link to a page where you can stop the alerts, and remove all of your related data from the site. Would you mind commenting on the button-under-collar shirt? Is it acceptable? And under what circumstances? Not everyone is svelte and trim. (Why call attention to that donut roll around the waist?) Perhaps some shirts are best left undarted. I’m not sure what you mean by a button under, John. If you mean one where the button is hidden under the collar point, I think that’s a personal quirk that can work if you wear it consistently, and there aren’t too many others. Generally, I would stick with a normal button down. What about monogram on the shirt? has never put them before on tailored shirts, and i know many people consider it snobby. what do you think? if this is still worth considering, where is the best to put them? thank you. Monograms are fine as long as nobody can see them. If you want to have one for the sake of others rather than yourself, don’t. If you don’t take your jacket off during the day, feel free to have one on the lower left chest. Otherwise restrict it to the front left hem, inside collar or under the placket where it will not be seen. If you want to write something that people can see, just go ahead and have ‘I have my shirts made’ sewn on. It is an exquisite pleasure to have a shirt made. I was recently in Istanbul visiting a friend and he introduced me to Milimetric (http://milimetric.com/). I had one measurement and two fittings where small details were adjusted and now I have two awesome shirts. I would definently recommend everybody to have a shirt made by a taylor – quite a different experience than RTW. Simon have you ever seen shirts with sleeves attached at an angle in relation to the shoulder line ie. not continuing along the shoulder line, but ‘dropping’ down at an angle? I was recently told that 15deg is the suggested sleeve angle for dress shirts but I’m not sure what to think of it. Most sleeves are attached at a slight angle Tom, as your arms are not stuck straight out most of the time. I have no information on precise angles though. A well-summarised post. If I were you, I’d add one more point though. Ironing by yourself. I think shirts are very spiritual item among men’s wardrobe and for that reason I would like to iron them by myself and wish to influence on the appearance of shirts. I’ve been ironing them by myself for almost 11 years now (basically, everyday!). I did not know Budd is having refurbishment. I may have a look next time I’m around there. Are you planning an article on Budd? I am considering having a bespoke shirts made by them (among the last British famous shirtmakers that still make the shirts in Great Britain, without asking for too big a minimum order AND opened on weekends). from what i have been told shirt tails make good frayed cuff and collar replacements for those wanting to avoid a white cuff or collar. seeing as the shirt is meant to be tucked in no one will be the wiser. I would like to know what are the pros and cons of shirt buttons being sewn on shanks vs sewn flat, and which one is most common for bespoke shirts. Hi – just to check, do you mean shank buttons, so those with domed top, for example, and metal shank behind that is sewn on – as with some blazer buttons? I wouldn’t advise using those on shirts and they are rarely used on bespoke. If you mean the natural stalk that is created underneath a normal button by the thread, so it stands away a little and is easier to fasten, all good shirts should have this, bespoke or not. I meant the natural stalk created by the thread. I wondered if there was any reason why it is better, beside the fact that it is easier to fasten. I went to Budd eventually (see above), and from what I saw on askandaboutclothes, sewn on shanks does not come as “standard” and you have to ask them. The advantage to a stalk is that the cloth that is buttoned can sit underneath it without puckering around the button. But I wouldn’t worry about it. Budd know their stuff and they wouldn’t leave out something as fundamental as that if it make a real functional difference. I think you’re stressing too much over details. Give more thought to the style and cloths you want. Only my very first shirt with Sean O’Flynn had all buttons on a stalk. All later shirts only have stalks at the cuffs and the collar, all the others are flat. Even the buttons on my earlier MTM shirts haste stalks. I cannot see another reason for British “bespoke” shirt makers using flat buttons than saving money. It is more pleasant to fasten a button on a stalk. What you say in tip no. 3 about strong collars when worn open is interesting – I’ve always had a lot of trouble with this while everyone else’s collars seem to stand up just fine. Nothing looks dumber than a guy with his collar flat on his chest on both sides. I have shirts from many brands, and so far the only ones which do a satisfying job are some made-to-measure shirts I got in Paris (place called JLR) with a wide spread and quite tall collar. Is it necessary to have a very wide spread to keep the collar from folding under the lapels? Or is the height more important? Could you elaborate a bit on the determining fators? Also, would you know any ready-to-wear brands which have a good collar for tie-less use? No, it’s not necessary to have a wide spread. The key is how the collar is constructed (how fused, thickness of interlining), its height and the shape of the band too. Unfortunately I’m not much help on RTW brands that meet those criteria. I have my shirts made at T&A, and now Kiton. The latter certainly stand up better, but for reasons I have mentioned. Sorry I couldn’t be more help. If in doubt get a button-down. I’m a long time fan of the site. Great writing. Keep it going! I’ve got a quick question on shirt alterations. Over the past few months, I’ve lost three stone in weight. This has been a curse and a blessing. While it’s nice to be thin and great to buy new clothes, all of my suits hung terribly before I got them recut (by the excellent Luke at Savva & Savva). My shirts have also become more like sails on a yacht than fitted shirts. Can you recommend a good London alterations shirt tailor who could cut them back in to shape? I’ve struggled to find anyone who can do then well. Russell and Hodge were just too erratic and slow in the past. Alterations after that much weight loss are always hard. No matter how good the cutter, it’s hard to get the drape right etc. You can easily dart shirts, and quite substantially. Graham Browne, for example, will do them at a decent rate. But you may find the fit will never be as good as the original – particularly because the collar will presumably now be too big. There’s no point altering this really – you might as well have new shirts made. That’s really good of you to come back to me! Thanks for the advice. I suspect, on balance, you’re right about the fit. I just need to be brave and chuck out the old big shirts. Hi. Is it weird for a lady to go into Shirt Making. Not Like I would make the shirts myself but I want to create a brand for myself in Mens’ shirts before diversifying into other (ladies)wears. Do you put button-down collars on non-Oxford shirts? Yes. Nothing wrong with that. what are in your opinion the essential shirts you should own? I have two white broadcloth and with french collar, one blue with french collar, one blue with white stripes bd, one white oxford bd, one grey bd, one blue with small checks with a soft collar and one blue oxford bd. All of them mtm, so the fit is on point. Good question, maybe one for a bigger post? I have been searching for the reason that shirt sleeves are fitted at a downward angle these days . Shirt sleeves used to stick out at 90 degrees when laid flat and that made movement easy. Now we are all expected to keep our arms down all the time. This causes problems for musicians especially trying to use a violin bow. I’ve been recently introduced to your website and really like the information you provide, a great help to someone who is trying to get into dressing well. I work in an office where (as others have said), trousers and shirt are pretty much the smartest you’ll see (ranging all the way to shorts and crocs most the year round). Also I find that wearing multiple layers is too much in an air conditioned office. Can you elaborate on this a little more and maybe provide some advice on shirt options when not being worn with a suit? Is this always the case or would a grey flannel trouser with light blue shirt be a suitable mix? I’ve been building up my trouser wardrobe after some of your fantastic posts gave some great advice, but I’m a little unsure what to do with my shirt side of the wardrobe. I’m thinking of waistcoats/cardigans as a way of layering to and from the office. Sure – on the shirt, it’s a question of playing with subtle textural differences (washed oxfords, linen, brushed cotton) or patterns, and on the collar finding one (often a button-down) that stays upright with any jacket or waistcoat etc. Have a look at my posts on Luca Avitabile for more on that. Grey flannel trousers and a light blue shirt would also be good – assuming the flannel separates you a little from the rest. Hi Simon, how long would you say it would take a shirtmaker as opposed to a tailor (making jackets) to complete fittings short of delivering the final product? (not including waiting time). Thanks! Hello , I am having difficulty with my sleeve cuff riding up my arm. Do you think this is due to the cuff size being too large or the sleeve length is too short? Probably the sleeve being too short, but it could also be affected by things like the armhole. Two questions: 1) where exactly should sleeves end? I had mine altered to hit the base of the thumb and they ended up too long. 2) what are for you the top five or ten essential shirts to have? I don’t remember seeing a capsule article on this and have wanted to ask you about it for a long time. My jackets end at the wrist bones so the shirts with the sleeves ending at the base of the thumb always extend around 1 inch past the jacket. But maybe the problem is ill-fitting cuffs. May I ask again where you have your sportcoats’ sleeves end? I thought at the wrist bone was what’s generally accepted. I have another quick question about shirts. On your non button down ones, do you use removable collar stays exclusively? By the way, you said you would do a capsule article on shirts. Have you gotten around to it? Simon, I have a few questions for you : How do your Abbarchi and Avitabile shirts differ in terms of fit? Would you ever take your best fitting shirt from from one and have it copied from the other? When ordering new shirts, do you get a new fitting once in a while? They don’t really. Avitabile is probably a little better, but not much. They don’t have different styles of fit.